More than 3,000 years ago, a group of people set out from the Solomon Island chain in the southwestern edge of the Pacific Ocean and steered their outrigger canoes toward the horizon, with no land as far as their eyes could see. These people and their descendants were the first to cross more than 350 kilometer stretches of open ocean into a region known as Remote Oceania. Now, DNA sequences are for the first time telling us more about the ancestral origins of these people, and their genetic legacy that lives on in Pacific Islanders today. 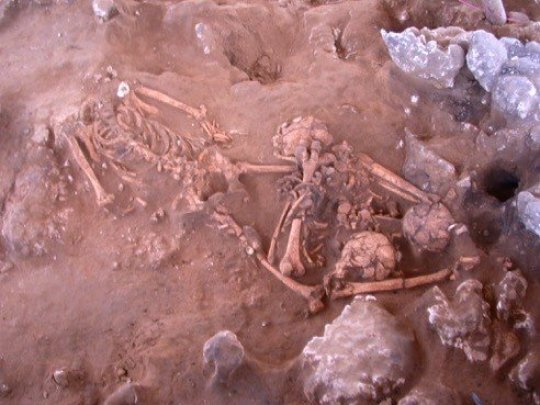 A 3,000-year-old burial in the Pacific Island nation of Vanuatu that is source of one of the ancient DNA samples reported on in this study. It is a triangular bone arrangement, with skulls at each vertex, lying on the legs of a skeleton without a skull. “The genetic data so far hasn’t been able to prove it one way or another. Nobody ever looked directly in the past to test the question. Up until now, all of the hypotheses were based on the blood samples and cheek swabs of living people,” said Merriwether, who spent a decade collecting and analyzing several thousand DNA samples in the Bismarck Archipelago with colleagues Jonathan Friedlaender of Temple University and George Koki of Goroka, Papua New Guinea. When the researchers examined the DNA sequences they found — to their great surprise — that the ancient individuals carried no trace of ancestry from people who settled Papua New Guinea more than 40,000 years ago, in contrast to all present-day Pacific islanders who derive at least one-quarter of their ancestry from Papuans. This means that the Remote Oceanian pioneers swept past the archipelago that surrounds New Guinea without much mating with local people. “A major and not previously recognized migration must have spread the Papuan ancestry that is found everywhere in the Pacific today ” said Dr. David Reich, a senior author at Harvard Medical School and at the Howard Hughes Medical Institute. The paper, “Genomic Insights into the peopling of the Southwest Pacific,” was published Oct. 3 in Nature. Web Source: Binghamton University, State University of New York.